Beautiful Memories and a Rainbow Welcome Home! The double and single rainbows were in the clouds when I was in the airplane, descending into the Houston airport. The mirrored curved wall was the coolest artwork in a very strange field of art sculptures. And Tasha is the black bear, 3 years old, playing in the pond. The fun thing about the trip was that I took thousands of pictures and all are beautiful, fun, interesting, and funny memories that I can look back on for years. In the meantime, I managed to type up more of the story after writing for 5 hours while waiting to board the plane and while flying to Houston. I only paused to take some cloud and rainbow pictures. I ended up with 19,000, which is 5,000 over my word goal! But, my gardens need major weeding. At 95 degrees, it’s just sooooo hot. I did take some zinnia pictures this morning, and I’m still downloading all the pictures I took on the trip. I still need to unpack more, but have to get my word count too. The puppies have been playing all morning. They’re happy I’m home, though they loved being at my daughter and SIL’s home with the baby and the corgis. Off to work… Have a super, memory-filled day! I wanted to take some pictures of the pine saplings that have sprouted from seeds in my yard to show their progress. They’re supposed to grow 2 feet a year! If you consider these sprouted from seeds, I believe it! The big ones I have are old forest, so in my small way, I’m adding back to the old forest that they cut down. In the one picture, that shows the old forest reflected in one of the ponds, and just how tall they get. I’ll be potting some for my daughter because they are all over the flowerbeds and some I’ve had to transplant to places where they can be allowed to grow. 🙂 <3 I just have to dig really deep to ensure I don’t cut off their tap root. But do you see the rainbow captured in the rain drop on the one picture of the loblolly pine? I meant to do that. Right. I couldn’t believe it when I uploaded the picture and saw that the way the sunlight hit the water drop, it created a rainbow in miniature. Now how cool is that? Baby is sick!! Poor thing. Now she has strep throat so she’s home with her momma and that means I’ll be pulling more weeds out of the grass in the backyard–some of the grass is fine, some of it is more weed than grass, and working on the story. 23,000 done, 57,000 to go! Save a tree! Plant some more! Give a little bit back to wildlife. Sometimes something that might be overlooked can make an interesting picture. I love wild grasses. As long as they’re not growing in my yard. But on a wilderness walk, they add interest to the landscape. Sun flare and can you see our fall colors? No? Well, see the three or four orange leaves? That’s it! A great blue heron! I love reflections in the water, and it was especially nice to capture the great blue heron in the water. Now, I had Tanner with me, and he was soooooo good. Whenever I stop to take pictures, he lies down for a rest. Luckily, he didn’t see the herons. Well, and luckily I didn’t scare them off either. You can see the white heron in the background. And I’d taken a number of pictures of the fountain from the other side, but when I was leaving, I figured I’d had enough shots of the fountain and was just going to walk on by. But I glanced at it anyway, and saw the rainbow. I had to take several steps back to capture it, and rainbows move and fade, so I took several shots, hoping to capture it before it faded. These were so much better than the others I had gotten at a different fountain because the backdrop was so much better. Tanner being an angel. When I was taking pictures of the pink fountain grass, he was lying down in the shade. He is really good about this. As soon as I start taking pictures in a spot, he lies down and waits for me to finish. I just step on his leash so he doesn’t wander off or chase something, and then snap away. Both of the dogs will do this together too, but my problem is when someone comes to walk by us if they’ve got another dog. So it’s just easier to deal with one, trying to train them to behave while on a walk. I love the pink fountain grasses, and figure they’ll begin to fade, so wanted to get another shot before they’re no longer pretty like this. Okay, got to write. 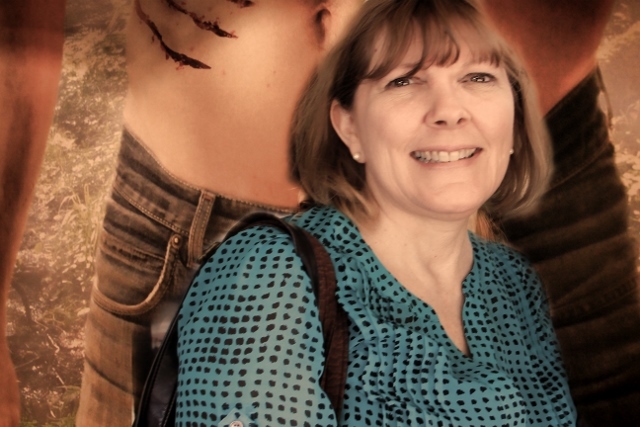 I had a million things going on yesterday, including the two-mile walk (beautiful, cool weather), and so need to get focused on figuring out the plot for the next White Wolf Book, did a lot of brainstorming yesterday on it, and keep up with the word count on Cougar Trouble. Have a super, fun day!!! Building up quickly again and we had another torrential downpour. Rainbow taken with camera but by that time it was fading. Used color enhancement and it appears there were two rainbows. Sunset turned the clouds a pretty pink. The lower layer of clouds had all turned pink, but as you can see, we still have a lot of massive storm clouds in the area. Massive cloud system still in the area when the sun began to set and turned them pink. We have heavy thunderstorms for the middle of the night and some tomorrow. But I’m fine with it as long as the houses don’t get flooded. I know that it will eventually stop raining and we’ll be wishing we had some again! Oh, and here is Max–I told him not to go outside while I was taking a video of the rain. Just like a little kid. 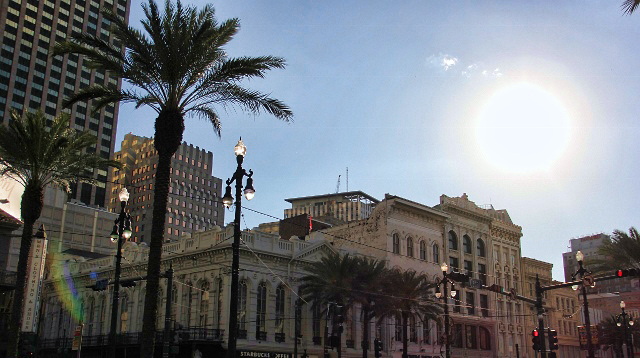 A Rainbow in New Orleans? Working on A SEAL Wolf for Sale now! Can you tell I was having fun at the conference? The basic theme of Ms. Spear’s latest adventure is best described by using Urban English: ‘when good guys go bad is when the real good guys are baddest’. Think about it. If the good guy was never a good guy but knows all the good guy tricks, it’s going to take a better good guy with serious skills to take him down, right? The trick is to rope in the heroic type into committing himself or herself towards the cause. What would generate the dogged determination and relentless pursuit of the criminal besides basic duty? In this case, a serious dose of lust and sensual intrigue tosses out the fishing line but the hook is set when the threat gets personal, and the pursuit of justice takes on a life of its own. 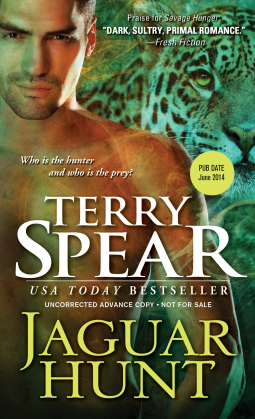 In Jaguar Hunt it’s a solid plot conflict with quite a few surprises in store for readers making it a real page flipper. Tammy and David spark off of each other early on in the novel. A reader sees them testing each other, feeling out as to what kind of personality each of them has. It’s comical at times, always interesting and it fit in with the movement of the plot. Little things happen, dialogue is exchanged and clues are dropped here and there throughout the story until a reader can finally start guessing who the villain is. I really thought I had it figured out. The joke was on me. I was caught by surprise by a couple of revelations and I loved that. Tammy and David’s search leads them into the jungle of Belize where they are forced to work as a team and live as a couple. Finding the missing teens is going to be child’s play compared to dealing with the chemistry between the two of them. And finding the missing teens is anything but easy. Of course teen boys are teen boys no matter the species and these two are rather creative in their desire to stay lost. The tryst factor remains an issue throughout the entire book and believe me when I say, I wasn’t sure who to believe until the very end. Well done. 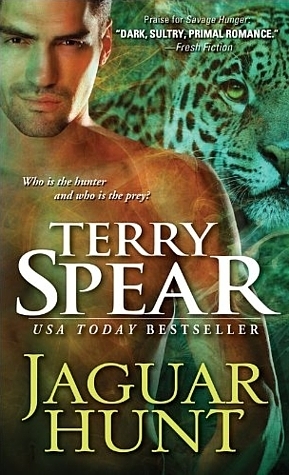 Once again Terry Spear takes us from the concrete jungles of home to the wild jungles of Belize. There is plenty of danger and she keeps us in suspense until the last minute trying to figure out who are the good guys and who are the bad guys.